This time last year Mark Cavendish was promoting his ill-fated moniker ‘FST AS FCK’. It was a slogan, or as his management hurriedly relabelled it, a “wow factor” marketing ploy, that promoted and denoted Cavendish’s standing as the commonly accepted number one sprinter in cycling. Ironically, the 100th edition of the Tour de France that followed saw Marcel Kittel (Giant-Shimano) supersede the Manxman with a bookend four stage wins, and since referred to as an equal fast-man of reference alongside André Greipel (Lotto-Belisol). It was a game-changing Tour where at some point Cavendish’s brash old ‘Fastest Man On Two Wheels. Fact.’ motto was seemingly retired. In the past 12 months the 29-year-old has been promoted more as a family man and rich business commodity than the speediest of his trade. But that’s not to say the 25-time Tour de France stage winner is on the road to retirement just yet. Omega Pharma-QuickStep has invested heavily in Cavendish. In his second season with the Belgian outfit, he will benefit from experience and familiarity with the group that has been further bolstered with the addition of reprised chief pilot Mark Renshaw as well as champion Italian veteran Alessandro Petacchi. Cavendish has had a successful season, notching nine victories prior to the Tour of Switzerland. The former world champion has put a great emphasis on the Yorkshire Grand Départ especially, and chose to skip May’s Giro d’Italia in which he said his participation last year took a significant physical toll prior to a career seventh lap of France. Cavendish himself hasn’t publicly recognised a changing of the guard, and maybe he won’t have to if he does emerge as the fastest sprinter of this year’s Tour. However, those within his camp have subtly done so with descriptions transforming from ‘the fastest’ to ‘one of’ in what is a more competitive Tour field. The pressure is on Renshaw as well as Cavendish to deliver at the Tour. The Australian is set to reprise his previous position as the last lead-out man in Cavendish’s train. One of the most iconic Tour de France photos in recent times is that of the pair celebrating a one-two finish on the Champs Elysées at the 2009 edition of the race, in which Cavendish amassed a career-best six victories. “I don’t think that will happen anymore. I think there are just too many good teams and too many good riders now. I think that happened once and will probably be the last time,” Renshaw said. The Tour de France is a warped reality in which people perform and function in a pressure cooker environment. Omega Pharma-Quick Step team boss Patrick Lefévère is unequivocal in what he expects, and the aforementioned competition, public anticipation, sponsorship and contracts at stake, plus the glory, physical and mental strain, and the relentless drive to those that compete, contributes to it all. Seeing Renshaw lead-out Cavendish to a stage victory in Harrogate would immediately alleviate some of that pressure — but it also contributes to it, at least prior to the day. As does Cavendish’s undeniable will to reassert himself and his standing at the race. “There is an enormous amount of pressure on us but there is also pressure on Kittel and Greipel now, which is good,” Renshaw continued. “We will try and roll with it. I think Cav is as good as any big rider in coping with the pressure, and he always performs when he has to. “There is always that pressure, it doesn’t matter what race you’re in. The best thing is you don’t really take notice in the race — it’s only before and after that you realise what’s happening. In the race you are focused and you’re doing the job. Cavendish has been vocal in his ambition to win stage one on home turf, and for the first time in his career wear the maillot jaune. It’s a rare honour for sprinters, although one Kittel experienced last season, riding in the yellow jersey for a day after winning the Corsica Grand Départ. But after his mainstream breakthrough at the 100th Tour, 26-year-old Kittel has lost any small advantage of flying under the radar. Cavendish has fielded many questions in official press circles and on social media about the broad 1.89m-tall giant, and in a recent interview with The Sunday Times took on more of a patriarchal role, referring to his rival as a “kid”. Kittel does have a boyish charm but shows a professional maturity beyond his years when it comes to racing, and is no slouch at defending titles — as a historic third consecutive Scheldeprijs victory in the spring showed. “To win a race for the first time it’s not easy but it’s much harder to defend the title two times,” he reflected after the semi-Classic. Kittel is not entering the Tour with a certain number of stage victories in mind, though he has earmarked the first, third to London and Champs-Elysées finale; two he won in 2013. “It’s the same mindset that we had last year before the Tour — the first stage we want to go for it and from there on we’ll see how it goes,” Kittel told CW in April. Kittel stands at an opposing end to Cavendish in the lead-up to the 101st edition of the Tour, and the onus on each to repeat or reclaim respectively adds to what should be some compelling bunch sprints. 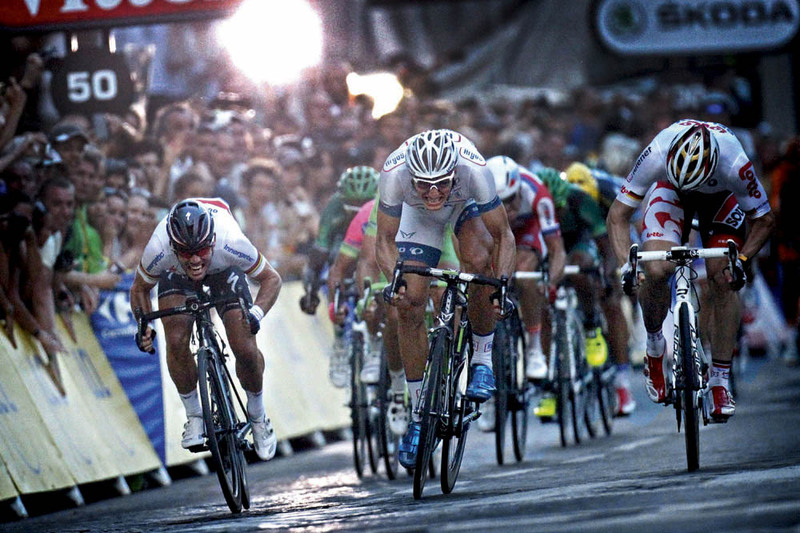 Repeat or better his 2013 effort and Kittel will beyond doubt secure his sprint king status. In a straight-up equal drag race, industry insiders have speculated that the German is quicker than Cavendish, with a more powerful, rather than speedy Greipel not to be discounted, too. But in order to maintain dominance Kittel emphasises the importance of not taking that external hype on board. “It’s important we don’t put ourselves under too much pressure that we have to go for a certain amount of wins or have to defend our title as a sprint team,” he said. Omega Pharma-Quick Step has strength in depth when it comes to selecting a Tour team set to be built around Cavendish. Team composition and orientation has become even more crucial given the competition, and Renshaw has adjusted to synchronising again with Cavendish in races throughout the year, after a stint as a marquee sprinter elsewhere. Lead-out combinations have been tested in racing, not training, and Cavendish’s team-mates have shown form in their own right. Time trial world champion Tony Martin and Michal Kwiatkowski are prime examples, marking big individual victories this year, which collectively bodes well. “We’ve pretty much only worked on it in racing. That’s why we’ve kind of picked up some extra races like [the Tour of] Turkey [where Cavendish won four stages],” said Renshaw. “We got a bit more of a chance to work on it there, which was good but no real training on the lead-out. “I’ve been racing quite a lot — probably more than I would have liked to race. At this stage we’ve got a lot of good riders and we just don’t know what order they’re going to go in,” he added. “We’ve probably more of a selection for the lead-out than most other teams because of the depth. Being a more Classics and sprinter type team we have more guys to choose from, so that’s probably the luxury. “We’ve got strong riders on each wheel — the last lead-out, second last and third last — so I think we’re in pretty good shape compared to the other teams,” Renshaw concluded. With Cavendish, Kittel, Greipel, and the more versatile, but ever-present, double green jersey champion Peter Sagan headlining at the Tour this year, the competition will be a career-defining turning point for more than one sprinter and for more than one reason. This article originally appeared in the June 26, 2014 edition of Cycling Weekly magazine.